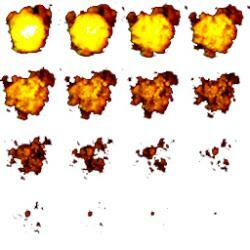 16 images of an explosion taking place. Each is 64 X 64. EDIT: added another pic with no background (exp3.jpg). POST EDIT: Added a .png version for alpha channel. It looks really good... except... the explosion just 'appears' from nowhere. There needs to be some kind of initiation of the explosion? Also the explosion is on a black baground which makes it difficult to integrate into a game. You can't overlay it on anything except black. It needs to have a transparent background. Ok, I see you updated it with a 'fill in white' BG. 1. did you make this explosion or rip it from another game? 2. do you understand that the lack of translucency in the explosion itself (which, being rendered and no pixel-art) means that you need to be using a full alpha channel on the explosion to create the effect in it's full glory? The 'lack' of alpha is what causes me to ask #1. 1. 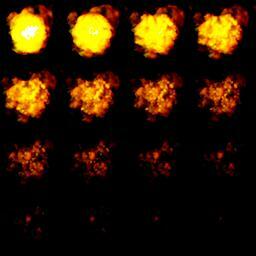 I used a somewhat dated program called 'explosion generator' by Cliff Harris to generate the raw image. I intended to list his website, but I could not find any reference to the explosion generator at it. I took the raw data and customized it using PhotoShop. I never intend to post ripped media. 2. The original version was in .bmp form, but to put it on the forum here, I converted it to .jpg. I erased the background completely, but it shows up white here. EDIT: uploaded a .png version. Hmm, not the greatest tool, no awareness of alpha channels. Oh well, the suggestion (use the explosion to create a mask) is a crude work around. 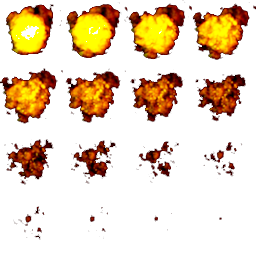 Those Explosions with black bg are just fine when rendering additive - that's going to look better than plain rendering anyway if you have several overlaping explosions. Textures with alpha do have their justification though and would make it even better. Possibly Gimp can map color to alpha linearly (not just the background). Yes !! I Agree with your statement !! Isn't the original explosion from an arcade game? is fantastic your creation ?? however, it will not fail to give you the right credit. credits are at the bottom of the page, thank you again.